Scientists are offering up their own theories as to what created the striking star-inspired image, which was captured by NASA's Hubble telescope in January. 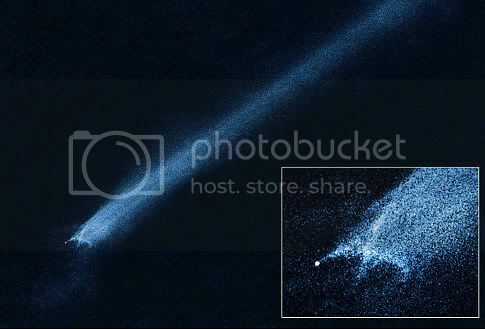 "Two small and previously unknown asteroids recently collided, creating a shower of debris that is being swept back into a tail from the collision site by the pressure of sunlight," said principal investigator David Jewitt of the University of California at Los Angeles. I'd be interested in knowing what the coordinates were for this object.